Jack Kramer: young serve and volley golden boy. Like Budge and Ellsworth Vines, Kramer had a big game, an attacking style that was exciting to watch. Forget Bobby's dominance over him when the two practiced against each other at the L.A. Tennis Club. Forget that before the war Bobby beat Kramer 9 times out of 10. Once, after having won 27 straight games against Kramer, Bobby told his frustrated younger opponent: "Look, kid. I know you're gonna be a player sometime and we're gonna meet and I just want you to know who's boss." 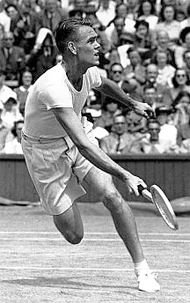 In 1946, Kramer lost just two matches in the amateur world. He won Forest Hills and anchored the United States team in its dramatic victory over Australia in Melbourne to regain the Davis Cup. He likely would have won Wimbledon that year had blisters not hampered him on his racquet hand. It seemed clear he would be the star of the next pro tour, which was expected to make a fortune. Bobby was the reigning professional champion and had established dominance over the previous champion, Don Budge. (Click Here.) By all rights, that tour against Kramer was his. Tom LeCompte is a freelance writer based in Boston. He is the author of the acclaimed biography: The Last Sure Thing: The Life and Times of Bobby Riggs. The Last Sure Thing: The Life and Times of Bobby Riggs. Bobby Riggs was a gifted champion who dominated tennis in both the amateur and pro ranks, winning 3 Grand Slam singles titles, and 3 U.S. professional titles. He was a life long opponent of the tennis establishment, a hustler who had an obsessive gambling proclivity and a troubled family history. His playing accomplishments were overshadowed by the hype surrounding his stunning straight set loss to Billie Jean King in the 1973 Battle of the Sexes. Read the real story of one of the great personalities in tennis history.